For torn skin: Pull, shape, tear and twist into FX features. 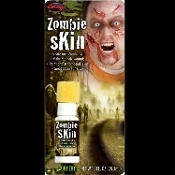 Simple and easy to create scars, wrinkles, warts, realistic wounds and torn dead skin. Packaging photo and name may vary, but it is the same product and product number. 1) Read instructions carefully before use. 2) Makeup may be applied under or over Fake Skin. 3) Fake Skin dries clear and shiny. For a matte finish, dust with powder. 4) A hair dryer may be used to force-dry Fake Skin before applying additional coats. Use COOL air only! 5) To apply Fake Skin, use a sponge to cover large areas. For fine details, use a disposable brush. Can be used as an adhesive to attache sequins, theatrical hair, fake noses or other accessories to the skin. *This makeup is manufactured from ingredients generally recognized as safe for use in cosmetics. However, as with any cosmetic, some individuals may experience an allergic reaction. A patch test is recommended. Apply a spot of product to inside elbow or wrist. Leave for 30-60 minutes. If a reaction occurs, discontinue use. Ingredients: *RUBBER LATEX*, water, ammonium hydroxide, thiram, zinc oxide. * For Adults and Teens ages 15 and over. *Never use in carpeted areas. Avoid contact with clothing, rugs and upholstery.